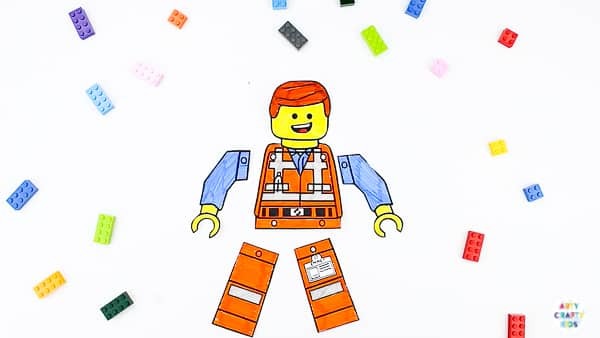 To celebrate the release of The Lego Movie 2 (in cinemas February 8th 2019), we were approached by Warner Brothers UK to create a sponsored LEGO themed craft. 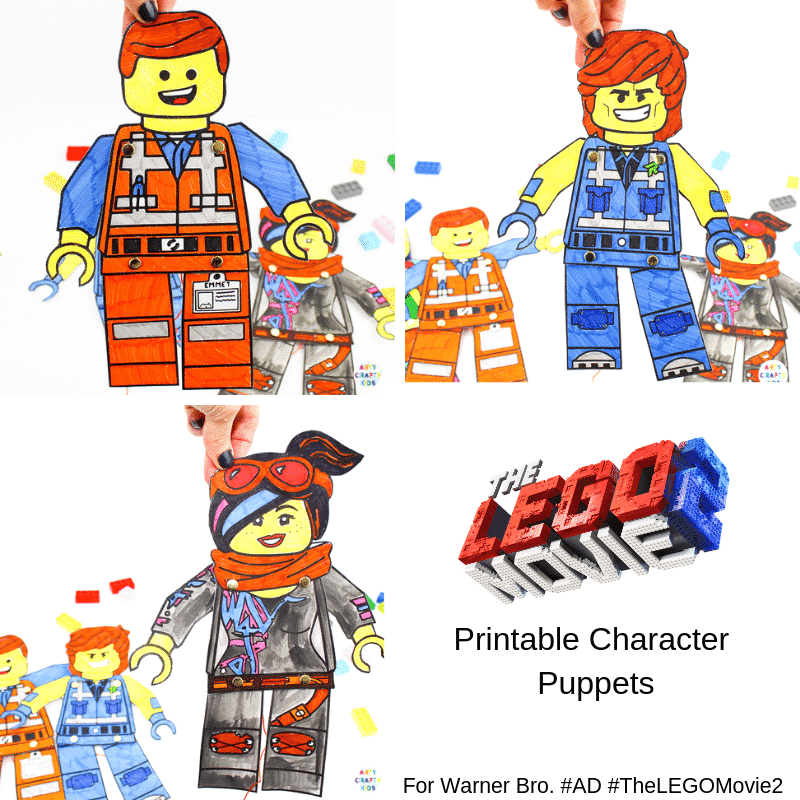 As huge fans of the first movie and everything LEGO, we couldn’t have been more excited by this opportunity and have created a super cool collection of Lego Movie Printable Character Puppets for your Arty Crafty Kids to colour and assemble. The much-anticipated sequel to the critically acclaimed, global box office phenomenon that started it all, “The LEGO® Movie 2” reunites the heroes of Bricksburg in an all new action-packed adventure to save their beloved city. It’s been five years since everything was awesome and the citizens are now facing a huge new threat: LEGO DUPLO® invaders from outer space, wrecking everything faster than it can be rebuilt. The battle to defeat the invaders and restore harmony to the LEGO universe will take Emmet, Lucy, Batman and their friends to faraway, unexplored worlds, including a galaxy filled with fantastic planets, strange characters and catchy new songs. 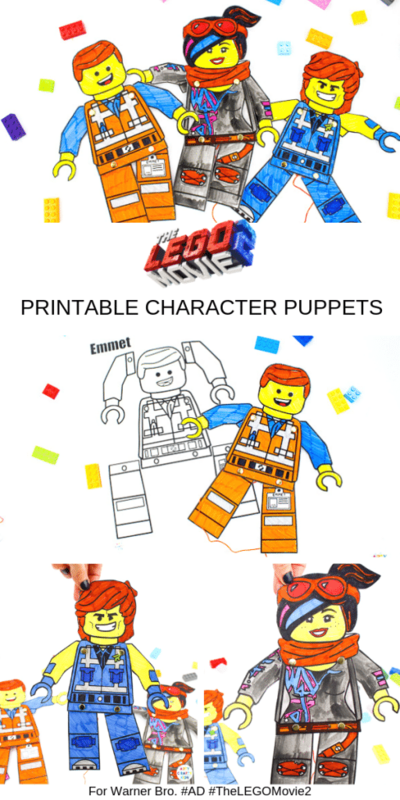 We have designed three character puppets for your Arty Crafty Kids – Emmet, Lucy (aka Wyldstyle) and Rex Dangervest – all available for download as a complete FREE LEGO Puppet Bundle! 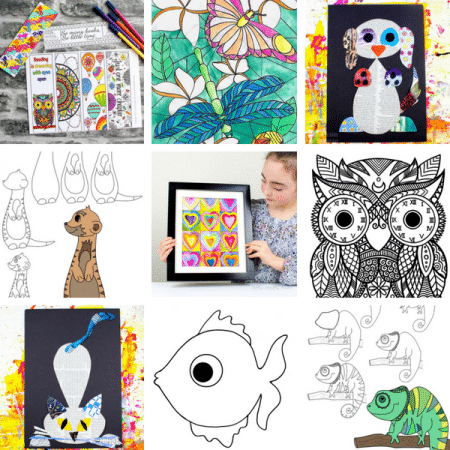 Simply colour, cut and assemble to bring these awesome characters to life! 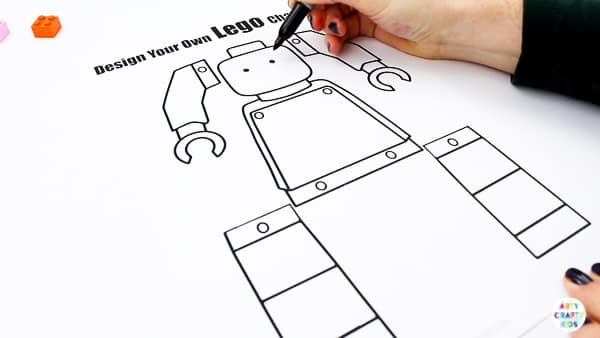 And in the spirit of creativity, Arty Crafty Kids can use the blank Design your Own Lego Character template to recreate their favourite LEGO character or design a brand new one! 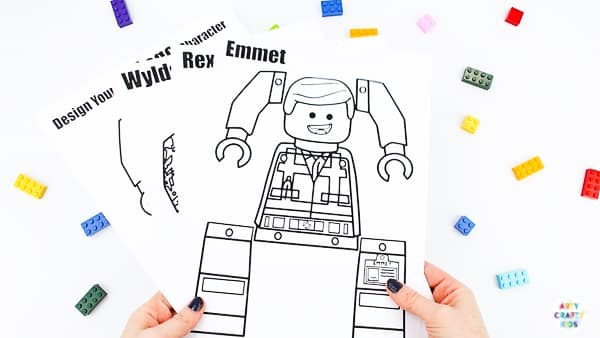 Download Emmet, Lucy, Rex Dangervest and the Design your Own template as a complete LEGO Puppet Bundle when you sign up to our weekly newsletter! The sign up form can be found towards the end of this post. Download and print the templates onto white card stock (under 200gsm). Before printing, check your print settings are set to ‘fit to page’ and ‘heavy card or card stock’ is selected under media. 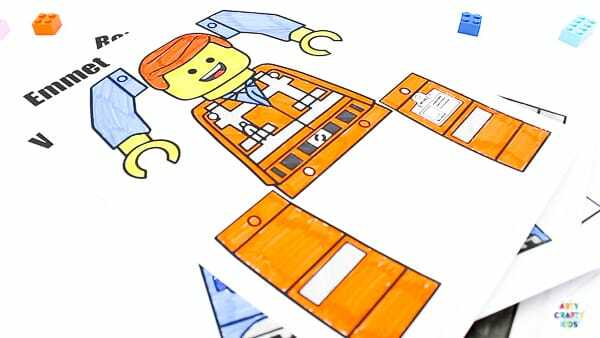 Grab a pencil to recreate a favourite LEGO character or design a brand new character! 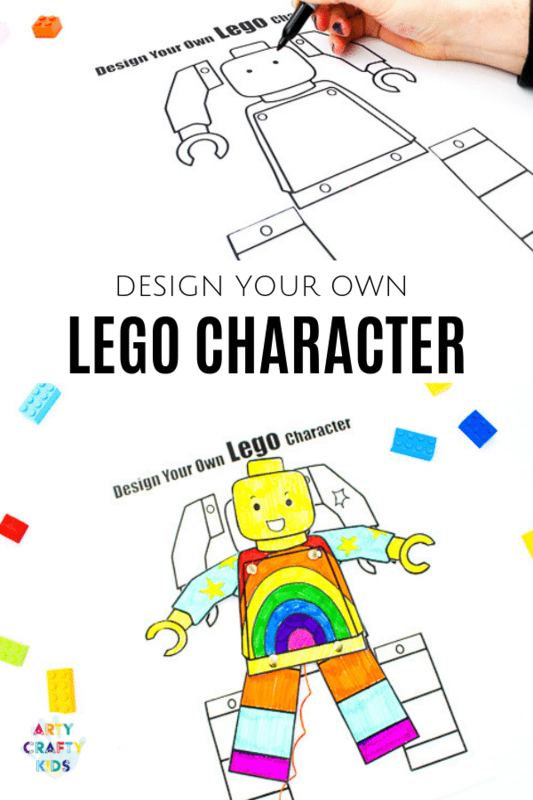 Encourage your Arty Crafty Kids to think about the personality traits of their new character. 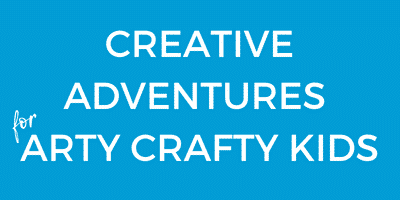 Perhaps they can write a story board to bring their puppet to life? Our examples have been coloured in with a mixture of felt tip pens and watercolour paints. Carefully cut out the character elements. 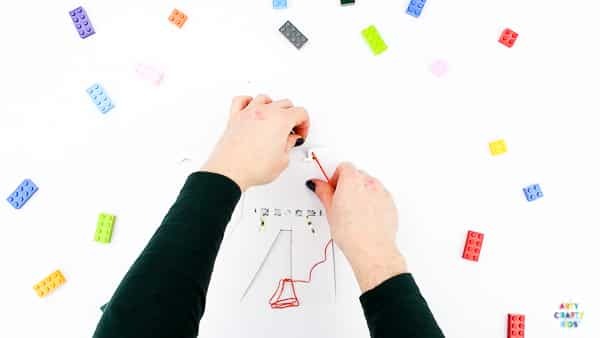 The characters have been designed with little hands in mind and are large enough for Arty Crafty Kids to have a go at cutting the elements for themselves. 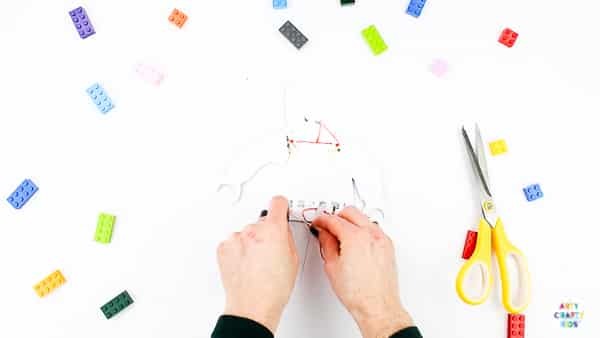 Locate the circles on the body, arms and legs, and create holes with a hole puncher OR if you do not have an available hole puncher (like us), simply pierce the holes with the split pins and spin to create a roomy hole. Place the arms and legs behind the body. Line up the holes and secure with a split pin. Make sure they’re not secured too tightly – the arms and legs need free and easy movement! Once you’re satisfied the arms and legs have a good level of movement, thread a piece of cotton through the needle and tie a knot at the end. Pierce the needle through the top of the arm as shown above and thread the cotton across to the other side. Secure the join with a knot. The cotton between the arms shouldn’t be too tight or too loose. 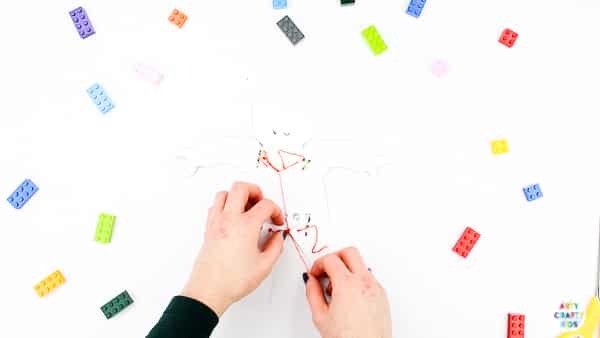 This may take a some trial and error to get right, but you should be aiming for limbs that can easily move with a slight pull of the connecting cotton. Repeat the previous two steps to connect the legs. 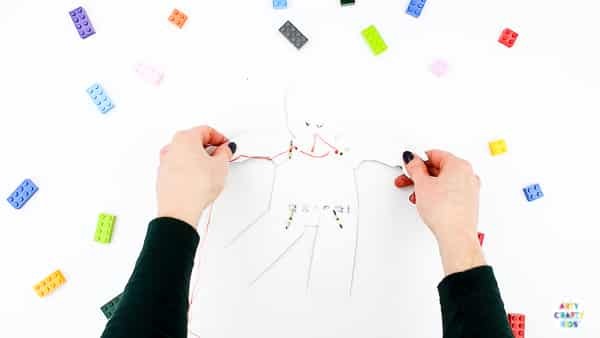 Attach a piece of long cotton thread to the centre of the strand joining the arms together and then again with the legs. 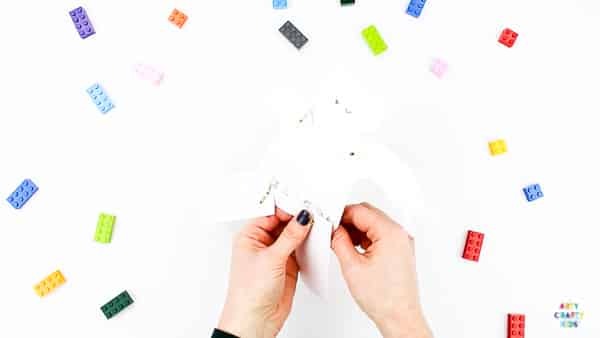 To access the LEGO Puppet Bundle , sign up to our Arty Crafty Kids Club newsletter, and we’ll also keep you posted about other crafts, free templates and offers for the Arty Crafty Box! 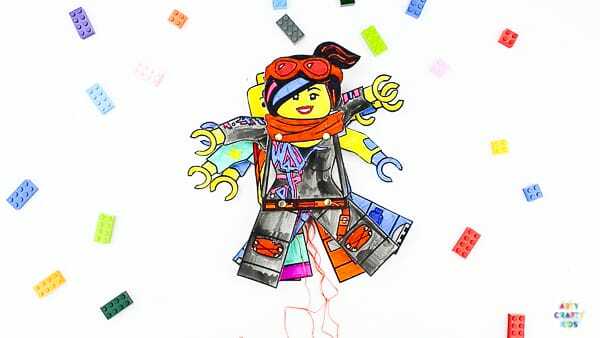 I hope your Arty Crafty Kids have awesome time creating their Lego Movie Character Puppets! 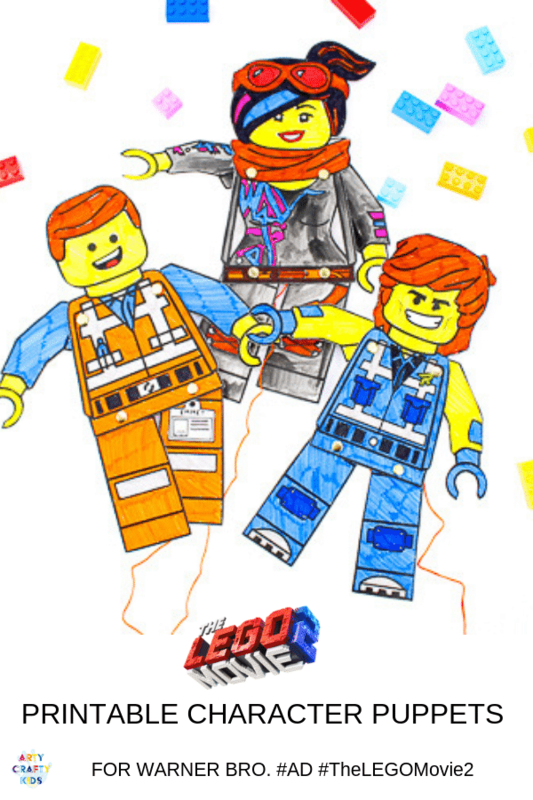 In the meantime, do head over to a local cinema from February 8th to check The LEGO Movie 2.